After we wrote a news post on the AOC I1659FWUX USB monitor, many of the commenters lamented the fact that the AOC was both thick and heavy, while others said that they wished that it used a more modern connector for power and video transmission, like USB Type-C. As luck would have it, one such product is about to hit the market. Although unveiled all the way back at IFA 2016, the ASUS ZenScreen MB16AC looks to be ready for release and it is still very appealing in many respects. The MB16AC is a 15.6-inch USB monitor with a resolution of 1920 x 1080 and a conventional refresh rate of 60Hz. It features an IPS panel without an anti-glare coating, a brightness of 220 cd/m2, and a contrast ratio of 800:1. We have no information with regard to response time or viewing angles, but given the IPS panel and the intended usage the viewing angles should be pretty decent. Since this product is designed to be highly portable, there has clearly been a lot of focus on keeping the dimensions as compact as possible. For starters, thanks to a sturdy metal rear cover with a concentric circle finish, ASUS has been able to make the MB16AC remarkably thin at only 8.0mm. The metal construction also allowed them to reduce the bezels surrounding the display to a relatively narrow 6.5mm. 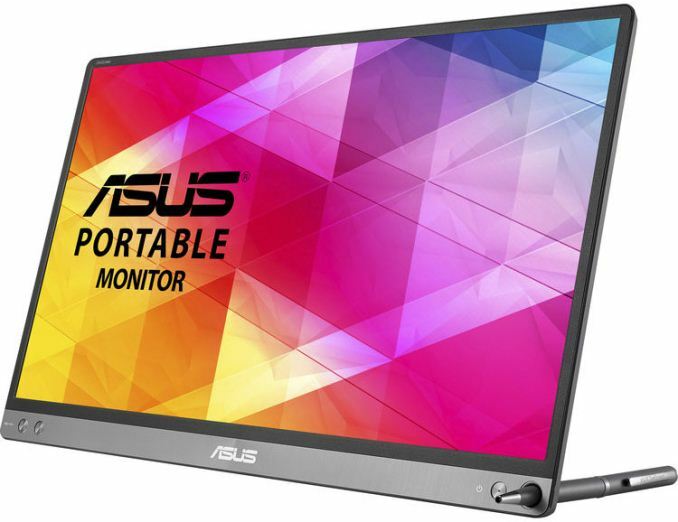 The overall effect of the compact dimensions is that this is also a very lightweight USB monitor, weighing in at svelte 780 grams. 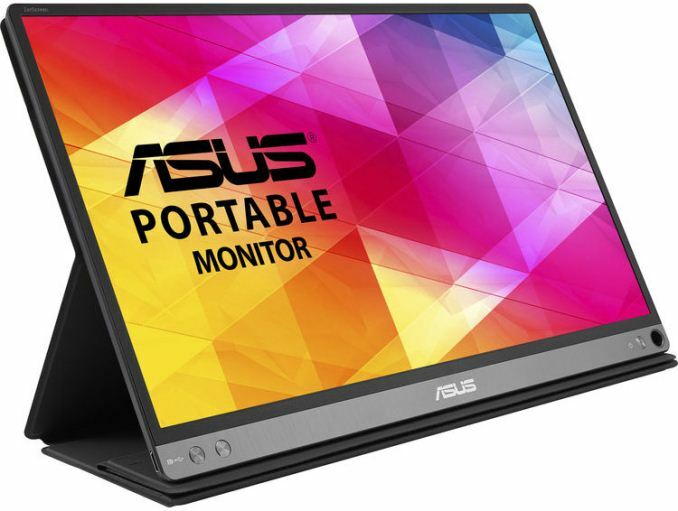 The included synthetic leather ASUS Smart Case is 1mm thick and not only helps protect the monitor from dust and scratches, but is claimed to be ergonomically designed to hold the MB16AC in both landscape and portrait orientation. If you don't want to use the case, the display can also be propped up in either orientation by simply inserting the included ZenScreen pen or any pen into the little hole in the corner of the monitor. The built-in auto-rotation feature should eliminate the need for any manual intervention. Like many other portable monitors, the ZenScreen MB16AC only requires a single USB connection for both power and video transmission. However, this model features a hybrid USB Type-C port that not only supports DisplayPort over USB-C, but is also fully compatible with USB 3.0 Type-A ports thanks to an included USB-C to USB-A cable and a driver. Power consumption is listed as 8W or less on average, which is fine for a USB Type-C port, but that load will probably need to be split across two USB 3.0 Type-A ports. There is also a host of screen overlay functions, like a crosshair, timer, alignment grid, and photo modes. Last but not least, there is the ASUS Eye Care technology that is designed to combine flicker reduction and a blue light filter to reduce eye fatigue. We have no firm details with regard to pricing or availability, but Netherlands-based online retailer Redable.nl expects stock as early as May 29th, while US-based B&H Photo Video lists expected availability on July, 2017. There is also a product listing on Amazon.com that says "Temporarily out of stock".